Dry pilling can lead to pills getting stuck in your cat's esophagus (the tube leading from the mouth to the stomach). While dry pills are likely to get stuck, capsules are even more dangerous for cats. The smooth, gelatinous surface tends to cause capsules to lodge in the esophagus. Veterinarian Dr. Melissa Van Vechten tells a story of a cat who had several days' worth of capsules lodged together in his esophagus, almost totally blocking it. A 2001 study presented in a veterinary journal stated that "After 5 minutes 84 percent of capsules and 64 percent of tablets are still sitting in the esophagus." The study also brought out the specter of esophagitis, which can be caused by the irritation of pills and capsules remaining in the esophagus for long periods of time. Follow Pilling With Liquid: Use a small 1 cc syringe filled with either plain water or low-salt broth. Dr. Lisa Pierson recommends approaching the cat from the back or side, rather than front-on. She also advises keeping the cat's head level rather than tipped back, to facilitate swallowing. Conceal the Pill in a Pill Pocket: Pill Pockets are cone-shaped, soft treats with a hole down the center. They come in chicken or salmon flavor. Just pop the pill inside and pinch the top closed, and offer it to your cat. Treat After Pilling: Offering a favorite treat will not only encourage future pilling cooperation but will help get the pill into the stomach quickly so it can go to work. Canned Food After Pilling: Try giving only a small portion of a regular meal of canned food before the pilling, and withhold the balance for afterward. Compounded Flavored Meds: Some pharmacies will compound medications into flavored liquid doses, which are both easier to swallow, and a lot tastier than pills. Your veterinarian may work with a compounding pharmacy, a "regular" pharmacy may have flavors for pets, or you can find them readily online. 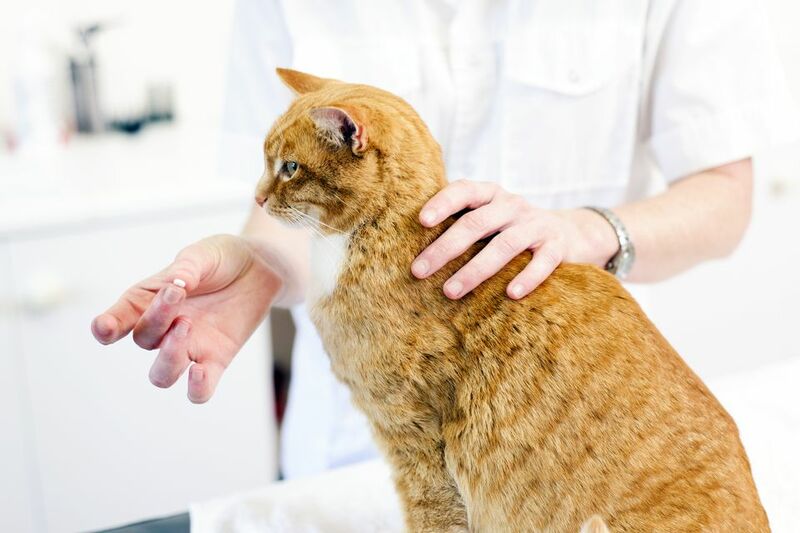 Transdermal Meds: Some medications can be formulated into a gel or ointment that can be rubbed into your cat's inner ear. These can also be compounded by pharmacies. At least one of these solutions should relieve both you and your cat of the anxiety and discomfort found in dry pilling. It will help ensure the medication reaches the intestinal tract to be absorbed rather than being stuck in your cat's throat.